Writers need readers and encouragement, and the writing workshop format provides both. 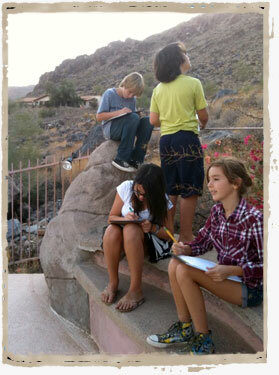 By coming together at the Mummy Mountain workshop table, participants join an intimate community of motivated writers. Led by Mel Smith, a published writer, the group first annotates others’ work and then convenes for each writer to hear each member’s constructive criticism, suggestions, and — most importantly — encouragement for his or her current draft. There are groups for every age and level. Come on up to Mummy Mountain, where the views are awe-inspiring! Arrangements also can be made for workshops to come to your home or library.